As I continue to ponder running for Municipal Council this fall, I've begun to sketch out potential messaging. Who am I? What do I say about myself that would put my candidacy into that place of meaning for the many people who have no idea who I am? Russell THOMAS is a dedicated husband and father and a fierce advocate of Wood Buffalo and the BIG SPIRIT that sets us apart from any place on earth. For the past 15 years he has been a strong proponent of arts, culture and festivity and the role that celebration and expression play in building quality of life. A graduate of the inaugural class of Leadership Wood Buffalo, Thomas credits lessons learned and relationships built through that program as the seeds that blossomed into the creation of Events Wood Buffalo, an organization that grew out of the Fort McMurray interPLAY Society and is substantially enhancing special events and festivity in our region. A passionate leader at Keyano College, Thomas believes that we can do so much more when we do things together. He loves Wood Buffalo. It is his home and his future. 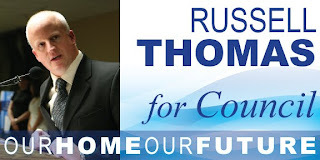 Russell Thomas is a professional communicator and thinks the ability to connect with a broad range of people through the Internet is an extraordinary thing. He encourages you to seek him out, ask questions, and share your perspectives. 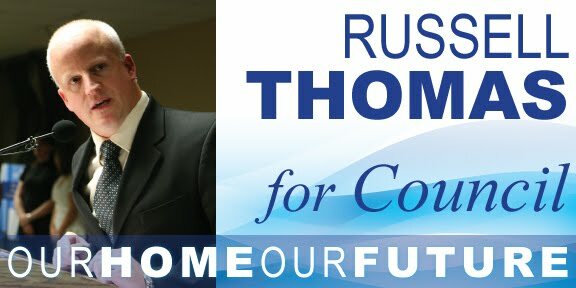 Find out who Russell Thomas is, so that on October 18th you can give him your vote for Councillor in Ward 1 of the Regional Municipality of Wood Buffalo. How does that work? If you don't know me from Adam, does that resonate in any way, shape or form? I've also been toying with a campaign slogan: OURHOMEOURFUTURE. As a resident of Fort McMurray and Wood Buffalo since April 1996, I've not only lived through the most dynamic period in our history, I met my wife here and am raising our two sons here. And while our respective blood systems run green, both being from Saskatchewan, we have planted roots in Wood Buffalo and consider this our family's home. So, what do I stand for? What do I believe with respect to some of the issues that might emerge this fall? ...that quality of life is everything and is the number one concern of residents. With the substantial completion of the MacDonald Island Park redevelopment and visible progress on some of our transportation woes, we're heading in the right direction. But we need to keep our eyes on this ball, always. ...that development and progress are good things. ...that the vision for our riverfront must become reality and a point of pride for Wood Buffalo. I dream of the day when I can take visiting family members on a stroll along the river on wide sidewalks, over well-developed park spaces and to scenic viewpoints. Our history is rooted in our rivers and our riverfront development must reflect this fact. ...that business and industry are our friends and that reasonable taxation is a must. Robbing Peter to pay Paul is just plain dumb. A balanced approach is the only way to go. ...that we have made great progress as environmental stewards, but that we can do better. We've done a great job with paper, tin and glass recycling. Add plastics to the mix and our solid waste numbers will plummet. ...that the role of council is to provide strategic direction and to set policy, not to micromanage Municipal staff. We are a corporation with over 1,000 staff. They need strategic leadership, not someone pointing out which cracks to fill on the sidewalks. ...in collaborative governance, working across sectors and breaking down silos. My wife asked "What are silos?" Essentially, it's the notion that we can't solve our problems, achieve our goals, overcome adversity in isolation. We need to reach across the table and engage our stakeholders, our neighbors in industry, government, public and private sectors. We're all in this together. Next, I'm working on a set of FAQ's, or questions that might come up when I'm able to publicly announce my candidacy. Stay tuned.